The museum gates had not opened so had to shoot from between the gate bars. Located at M.G. Road, near Gateway of India, in South Bombay, Chhatrapati Shivaji Maharaj Museum has Indo-Saracenic style of architecture. Its façade is made of yellow and blue stones, mined from the Bombay region. It has an assortment of details from different Indian styles like small spherical cupolas on towers, saracenic arches with Muslim jalis as fillers, semi-open verandahs and jharokhas (windows) of Rajputs. 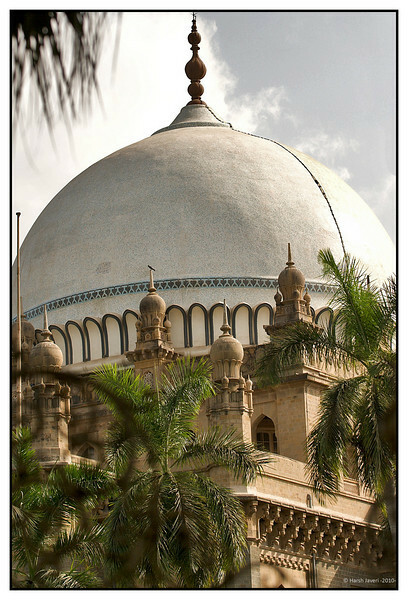 Its dome has been designed deliberately, so as to append variety in the skyline and make a landmark at ground level. Art, Archaeology and Natural History are three exclusive sections in the museum. It houses some of finest collections, ranging from ancient Indus Valley relics to the artifacts from the Gupta and Maurya Periods. Here, one can see a few of the rarest and earliest exhibits of Indian history. There are scores of interesting artifacts from foreign countries like Tibet and Nepal. It has one complete gallery comprising the exquisite tankha scrolls of the Buddhists. Another gallery is devoted to bronze castings and sculptures. In case intricate paintings happen to be your interest, you will be delighted to see the compilation of more than 2,000 miniature paintings from the different art schools of India. The variety of art displayed in the museum is definitely a treat for any art-lover. In concise terms, Chhatrapati Shivaji Maharaj Museum is an important cultural and education centre that certainly deserves a visit. Love this, and the palm trees in the f/g. Very nice comp and detail! Great capture, i enjoyed reading the history too. Love the angle with which you have shot this Harsh. Great capture of an amazing place.